EVENTS | CONFERENCES | MEETINGS WEBINARS Find current listings and archived webinars at mmsonline.com/webinars DECEMBER 4-6 San Diego, California carbonfiberevent.com Carbon Fiber 2018, presented by CompositesWorld, is the preeminent conference on carbon fiber and the expanding role of this material in the compos- ites industry. 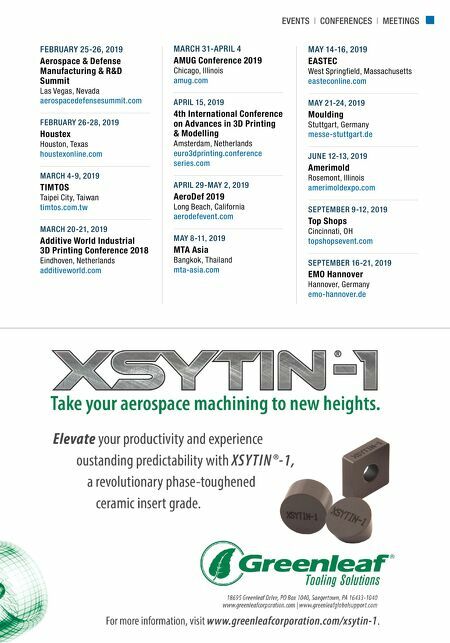 The conference offers cutting-edge information and access to industry experts in streamlining manufacturing costs, market outlooks, forecasting and more. 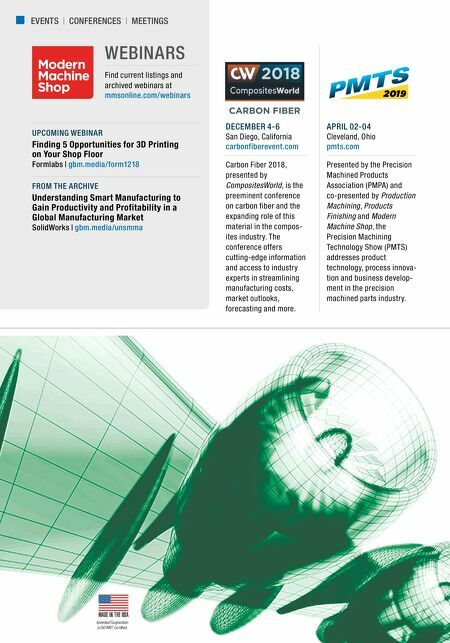 2018 UPCOMING WEBINAR Finding 5 Opportunities for 3D Printing on Your Shop Floor Formlabs | gbm.media/form1218 FROM THE ARCHIVE Understanding Smart Manufacturing to Gain Productivity and Profitability in a Global Manufacturing Market SolidWorks | gbm.media/unsmma APRIL 02-04 Cleveland, Ohio pmts.com Presented by the Precision Machined Products Association (PMPA) and co-presented by Production Machining, Products Finishing and Modern Machine Shop, the Precision Machining Technology Show (PMTS) addresses product technology, process innova- tion and business develop- ment in the precision machined parts industry.